This large retractable roof has apparently set a number of world firsts, since it features enormous panes of glass. Additionally, the blade frame elements are only 25mm thick and are formed in tapering arches with only 100mm minimum depth. Just nine glass panes seem to float delightfully over the courtyard of a country house and glide open as required. In a further ground-breaking step, the opening nature of the roof allowed the client team to enclose an area that fire officers had deemed must remain an ‘outside zone’, in order for the building to meet regulatory standards. The automation is fully integrated with the fire alarm. Upon receiving an alarm signal the roof opens at high speed to restore the status of an ‘outside space.’ The full opening cycle takes approximately 45 seconds. This particularly elegant bi-parting roof therefore now allows the large courtyard space to be used year round. A a warm, light-filled, welcoming area can be opened up into an outdoor area when desired. This enclosing of the previously open building core has revolutionised the way the use of the entire ground floor. The roof is installed on a listed building, and so had to be completed with very close attention to detail. meia assisted the design team in obtaining required permissions and worked sympathetically with the building to enhance and improve it. The roof elements are lightly curved to ensure suitable water run-off and to create an elegant profile. Our bespoke design approach allows installations that are enhancements to a building, in the style preferred by the customer. After extensive discussion and concept design research with the client team, meia presented multiple options over a wide price range. The design ultimately selected has just nine, vast, double-glazed units supported by the tapering arch blade framing. Our use of marine-grade stainless steel throughout allows us to create long-lasting beauty of the highest quality; for life span, performance and elegance. The specific layout of the existing building was carefully studied so that we could design a roof with the maximum possible opening space, which at the same time has minimal impact visually when closed. The latter concern is of high importance to the conservation groups protecting the building’s long-term future. Despite the size of the roof and its 13,500kg of moving mass, it opens in approximately 60 seconds. The drive components are additionally fitted with battery-operated secondary systems, ensuring continuous smooth operation in the event of power failure. Fitting such elegance is no simple task, and involves fabricating all the frames off-site and delivering them by means of escorted night-time delivery vehicles. To avoid damage to surrounding trees special low-lift cranes were used. Because of the complex logistics, delivery via helicopter was a seriously considered solution. 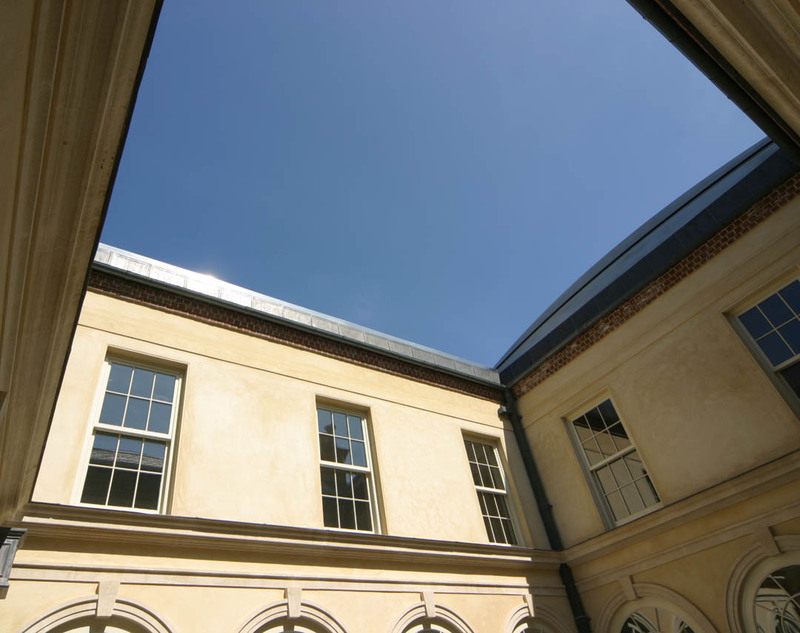 A massive bi-parting retractable roof over the 100m² courtyard of a listed building. Vast pieces of glass are set onto a gently arched frame. 14.5m by 7m.